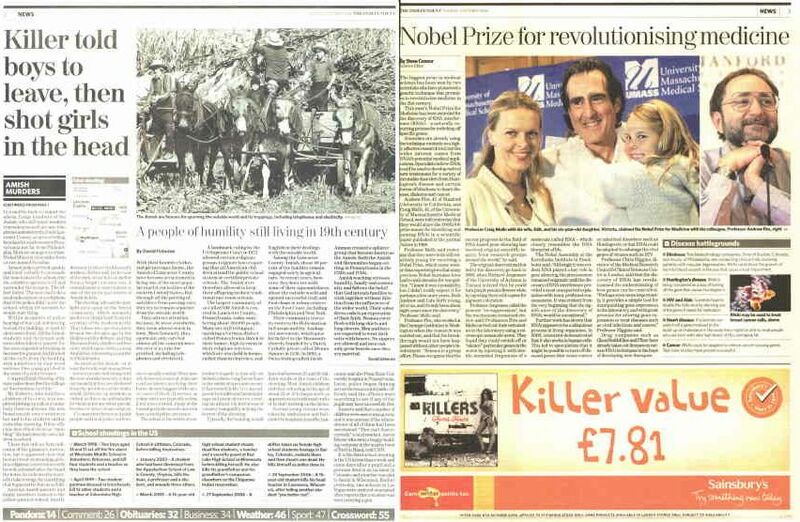 Contextual ad buffoonery isn't limited to the online world as clearly illustrated by the placement of this ad, sent to us by FishNChimps, for online supermarket Sainsbury's on the page opposite a story in yesterday's edition of the UK's The Independent about the Amish killings. What's even more buffoonish about this particular instance of buffoonery is that the ad appeared on page three of a printed newspaper which, one would assume, gets seen by human editors before it goes to print. We're guessing there was a big, collective "oops" heard 'round The Independent offices once that issue hit the streets. That's really funny. It's almost as bad as the time in the late 70s when I was watching "The Car," a supernatural thriller along the lines of Stephen Kings' "Christine," on TV. It cut from a scene where the car was about to crunch a bicyclist against a guardrail, directly to a Pizza Hut commercial where a pizza is slid toward the viewer. I didn't eat pizza for months.